Another Zest for Birds pelagic set out this morning, having been delayed a day due to the series of wild cold fronts that had been belting the Cape Peninsula. (Trevor was co-guiding with Barrie Rose, Alvin Cope and John Graham) We set off with some anticipation as the wind had dropped sufficiently overnight to allow the trip but was recent enough that we had hopes of finding birds still lingering that had been blown in from the deep south over the previous few days. 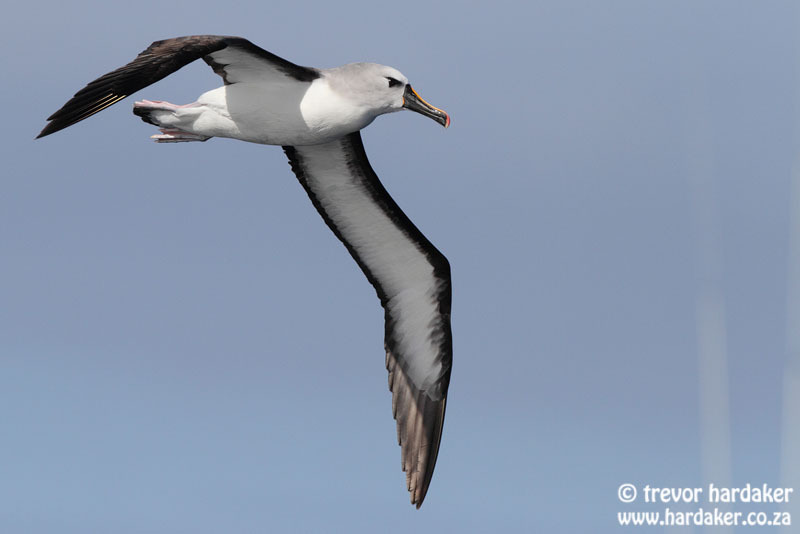 The trip through False Bay was in calm water, but already showed signs of the recent weather as we had White-chinned Petrel, Southern Giant Petrel, Subantarctic Skua and flocks of Sooty Shearwaters before even leaving the Bay. On rounding Cape Point, we were greeted by a moderately large swell that was still a bit bumpy from the recent wind, but with the promise that it would ease quickly in the light winded conditions we pressed on south-westwards. We had an excellent movement of Sooty Shearwaters in the first few miles beyond Cape Point and quickly also added Shy Albatross. 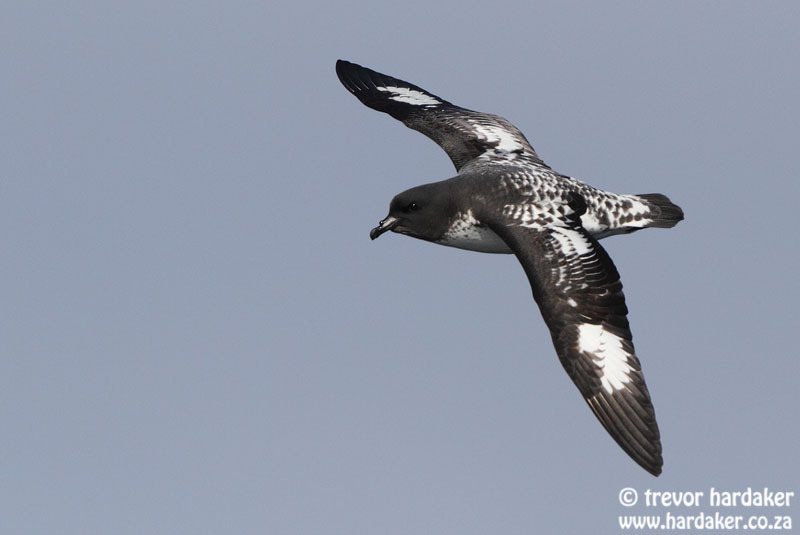 A late Antarctic Prion was a surprise and an unseasonal Great-winged Petrel added to the recent pattern of winter records of this species. While only partway through our voyage down to the trawling waters the shout of “Whiteback” went up and there to the east was a magnificent juv Southern Royal Albatross gliding gracefully down the face of a giant swell, clearly showing its distinctive white leading edge, white back and massive wingspan. The seemingly inquisitive bird passed close ahead of our bow and then proceeded to shadow us all the way to the trawling waters, remaining visible within 500m or so of us the whole while. 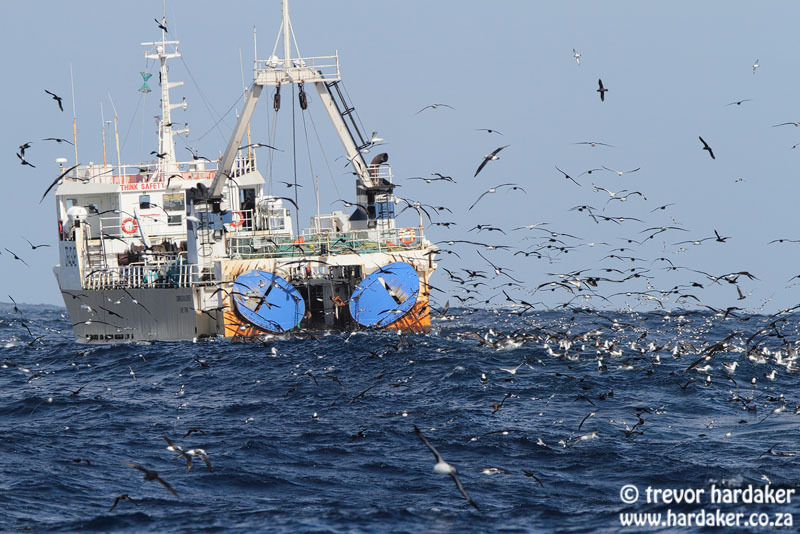 We spotted a couple of trawlers working in the vicinity of the Cape Canyon and as we approached the first, MV Forest Lily, we were bowled over by the vast numbers of birds feeding in her wake. 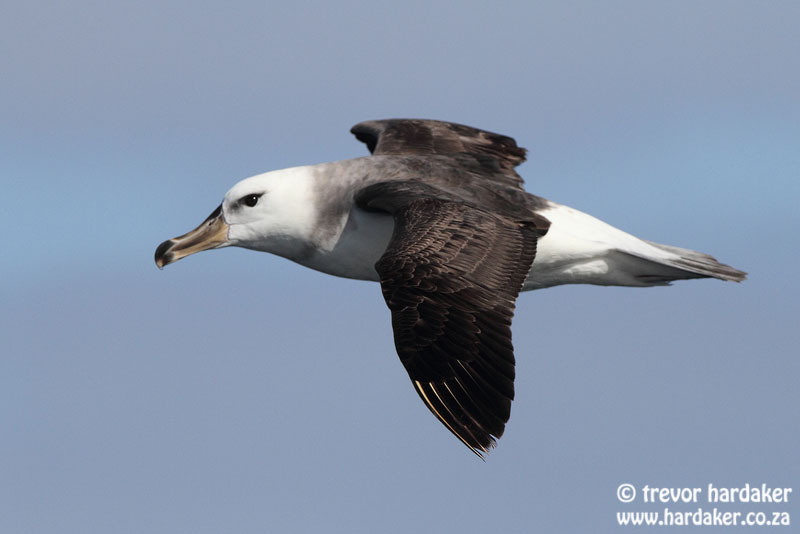 Pintado Petrels were abundant, and were joined by large numbers of White-chinned Petrel, Wilson’s Storm Petrels and albatrosses. The Southern Royal Albatross crossed our bow yet again and while flying over the multitude of foraging birds joined up with a crisply marked Northern Royal Albatross and circled alongside its fellow visitor from New Zealand waters for a while, unfortunately remaining a little distant from the boat. 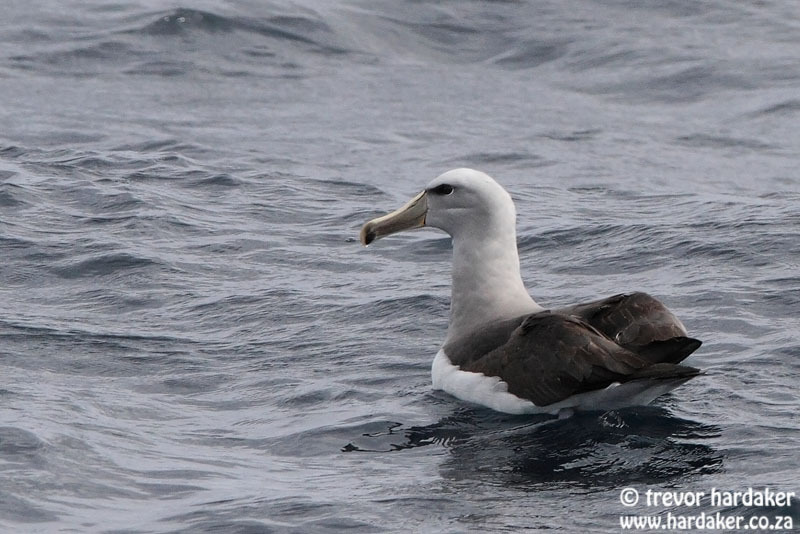 An Atlantic Yellow-nosed Albatross added to the albatross tally for the morning, and Black-browed Albatrosses were only slightly outnumbered by the Shy Albatrosses scrapping over fish remains broken up on the surface by Cape Fur Seals. 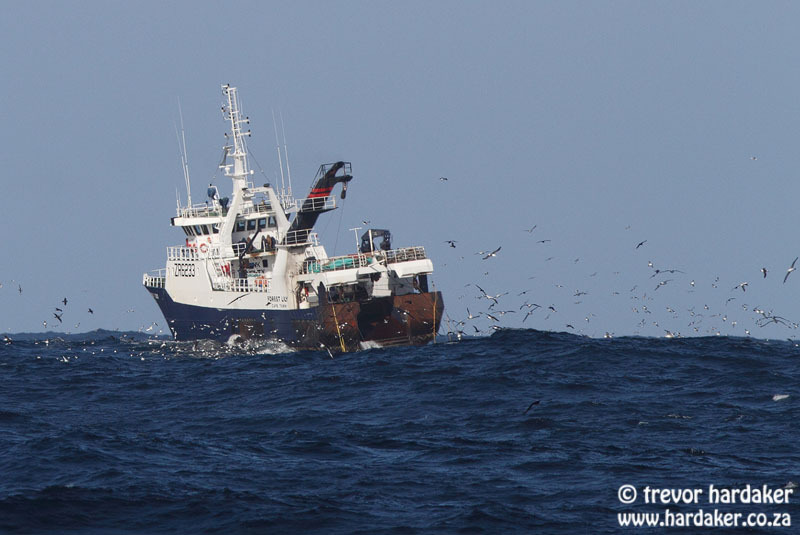 At this stage the second trawler, MV Compass Challenger, had approached close to us and as she had a whole new gathering of seabirds brought in from the southeast we detoured over into her wake. An excellent dappled brown immature Wandering Albatross glided effortlessly past our port bow and disappeared into the melee, and while picking through the hundreds of albatrosses in search of this we found our seventh albatross for the day, an excellent adult Salvin’s Albatross, an extremely rare visitor to our waters. 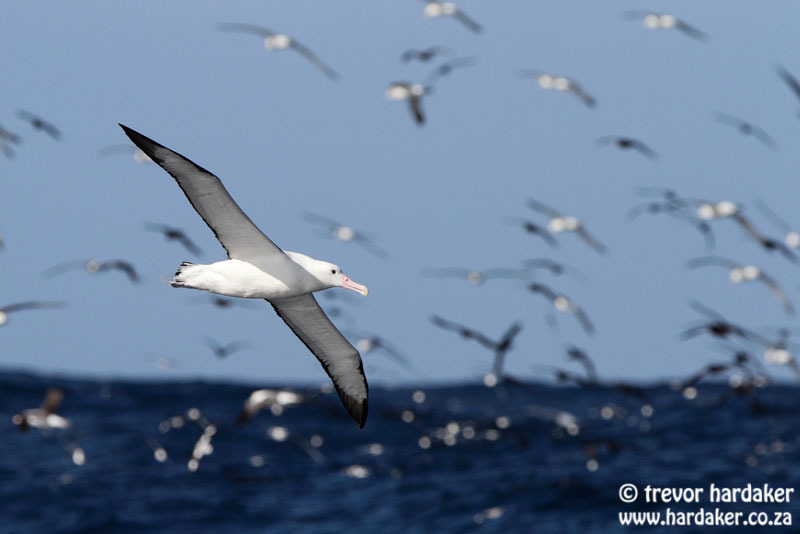 The search now of course switched to the Salvin’s, which we had lost sight of amongst the thousands of other birds before everyone had seen it adequately, and while searching we added another Northern Royal Albatross and a Stage 4 adult Wandering Albatross. 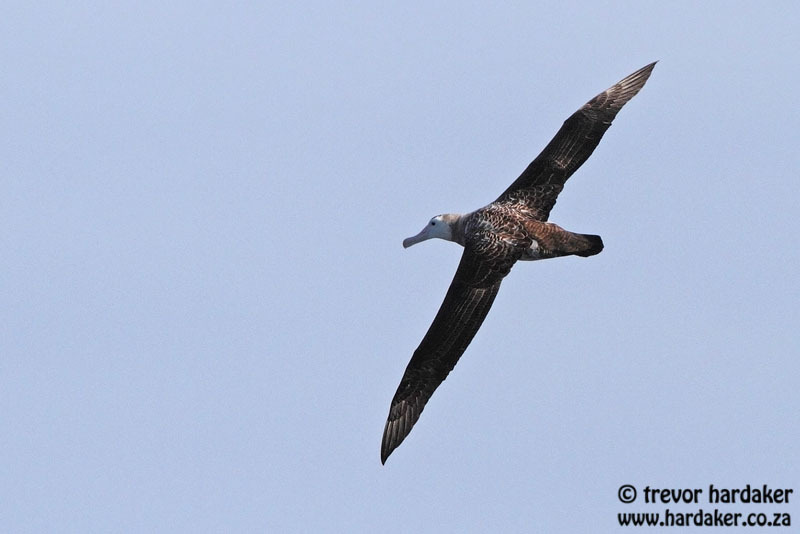 After adding a Soft-plumaged Petrel, Northern Giant Petrel and our eighth albatross of the day, an adult Indian Yellow-nosed Albatross, to the list we reluctantly set off homewards as we were running a little late. 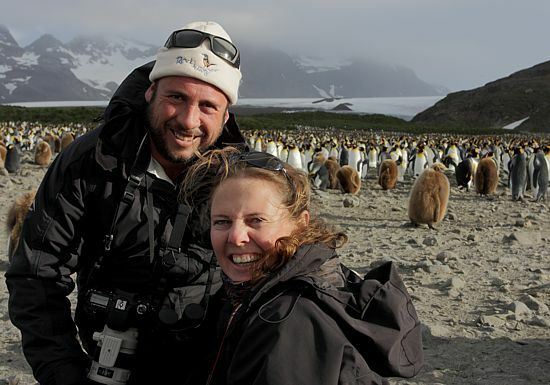 Our voyage homewards was punctuated by occasional great looks at Great-winged Petrels and further Giant Petrels. ~ by hardakerwildlife on September 29, 2013.